Our qualified and certified technicians can design, install and service door security systems in your home or access control systems in your business. An access control system enables an authority to control access to areas and resources in a given facility, as well as restricting entrance to a building or a room only to authorized people. Door security includes interior and exterior doors, gates and elevators. We can program your system to allow multiple persons different access levels. Advanced features such as biometrics, can be a part of your access control system. 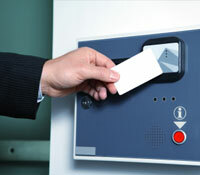 Access cards can be created with company ID or other information on it, to be used in keyscan access control. Access control systems integrate with other property alarms, intrusion detection, or CCTV systems. Through access control, Safety Net Security can lock down an area via a PC, track and control alarm conditions from a single interface, and create a map with active icons. Let Safety Net Security show you how to get the most from an access control system.